Is The Wasp in Avengers: Infinity War? Despite it being heralded as the beginning of the culmination of the Marvel Cinematic Universe at this point, the cast list for Avengers: Infinity War has been murky at best. Sure, we know most of the players who’re going to be in the movie by view of the two trailers, numerous TV Spots and plenty of posters released so far. What we have less of an idea about is who isn’t in the movie. Hawkeye has been completely absent from all the promotions. Captain Marvel is still a mystery at this point. Nick Fury, after being the architect of The Avengers program, is missing (although we speculate it just might be a ruse). And Ant-Man’s status in the movie fluctuates and changes every week like his size. Between all this, some recent information that has come to light has added even more fuel to the rumblings of Ant-Man and Wasp being actually present in Infinity War, more specifically Wasp. The first of these is an artwork that Marvel Studios shared on Twitter, captioned the Road to Infinity War (which coincidentally happens to be an ongoing series we’re working on). 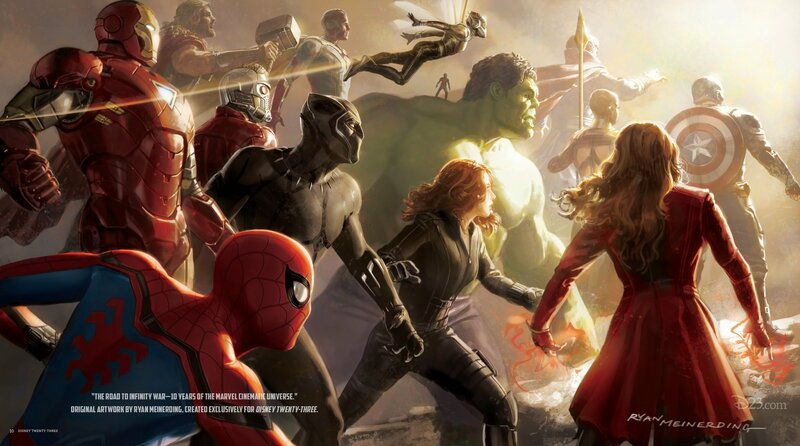 The artwork features most of the Avengers set to appear in Infinity War and surprisingly includes Ant-Man as well as the Wasp. While this may just be Marvel putting out a general artwork ahead of its D23 expo, it may also be an extremely subtle hint at the Wasp’s appearance / cameo in the movie. I’m not going to lie to you, I cried. You say to yourself, “Huh?” You have big stars talking about other big stars as in, “Gasp, is that Michelle Pfeiffer? It is! Oh, was that so-and-so?” It’s like their little Hollywood moment, which I found lovely and endearing. While we may be tempted to believe Alonso is referring to Avengers 4, the preceding question specifically refers to Avengers: Infinity War which is the movie the journalist was referring to. This is even stranger since having Pfeiffer appear in Infinity War before her MCU debut in Ant-Man and the Wasp could throw off newcomers unless they’re provided some background about her. And with the movie already stuffed to the brim with so many characters, we’re unsure if it has enough time to deal with the Wasp of the 70s. Bottom line? We’re inclined to call this one a no but the evidence is hard to refute. We believe there could be a potentially strong reference to the Wasp in some form or the other. If however Michelle Pfeiffer’s Wasp ends up in the movie, it could either be through a flashback sequence giving more insight into her operations with Hank Pym and other predecessors of the Avengers or through the Quantum Realm where she is currently trapped waiting to be rescued in Ant-Man 2. Do you think there’s even a 1% chance Michelle Pfeiffer could appear in Avengers: Infinity War? Let us know what you feel in the comments below.